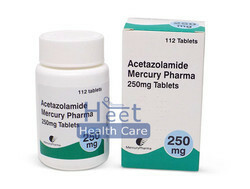 Exporter of a wide range of products which include acetazolamide tablet. The active ingredient acetazolamide is considered a carbonic anhydrase inhibitor type of medication. The medication works by reducing the amount of salts in the body to promote a loss of fluid from the body. It can decrease the amount of fluids created in the eye to reduce eye pressure and help prevent blindness caused by glaucoma. When taken along with other medication, the tablets may be useful in the treatment of some types of epilepsy. Some people may also use the medication to prevent and treat the severity and duration of the symptoms of acute altitude sickness (mountain sickness). It is usually taken orally 1 to 4 times per day or as directed by a doctor. To prevent an upset stomach, the tablets should be taken with some food along with a full glass of water. Contact a doctor for the correct dosage and length of treatment as it will depend on the condition being treated and the patient’s response to the therapy. The tablets should be taken whole and not broken, chewed or split as it may increase the risk of side effects. It is not always suitable for all patients. Always consult your health care provider prior to using this medication if you are pregnant, breastfeeding, trying to conceive, using any other medication (prescription or non-prescription), using any herbal products or supplements, or if you have any allergies or other health problems.